Over 54 years of reliable service. 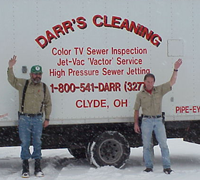 DARR offers a wide variety of services for industrial, storm, & sanitary sewer systems. A proven leader in sanitary & storm sewer cleaning & televising. Residential, commercial, municipal and industrial work. Since 1960 we have offered a wide variety of services for industrial, storm, & sanitary sewer systems. From TV inspection to high pressure sewer jetting & everything in between, give us a call to see how we can take care of your needs. Whether residential, municipal, industrial, or commercial applications, we have the equipment & experience to serve you. We serve primarily Northwest & North Central Ohio. Please contact us to see if we cover your area. In 1998, horrible tragedy struck when our brother, business partner & friend Randy Darr was killed by a train at a blind rossing while running business errands on a Saturday morning. He left behind a wife & 3 young daughters that meant the world to him. He was 32. Randy, we will forever miss you. ARIES INDUSTRIESTV inspection of 8” to 60” lines. TV inspection of 3” to 6” lines. ©2014 Darr's Cleaning. All Rights Reserved. Design by NWOL.